Thank you Toonalooney Studios, LLC for rolling out its newest iPhone app, Mexi-Pedia! The next time you go out to a Mexican Restaurant, open up this cheat sheet of Mexican foods. It will save you time, and you won’t need to ask the waiter a ton of questions every time they walk by your table. Growing up in the Midwest, I wasn’t exposed to many different cuisines. In fact, I can count one Mexican restaurant near the town I grew up in, Tres Amigos. Although this fine Mexican establishment offers a variety of tacos and salsas, I was shocked when I came out to Los Angeles and looked on a real Mexican restaurant’s menu. This app is for all of you out there who can’t remember if chorizo is seasoned pork or sausage, what the difference is between a flauta and a taquito is, and if a sopapilla is a dessert or an appetizer. 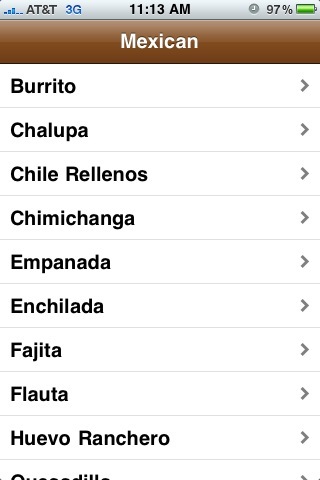 Mexi-Pedia is very user friendly, just open the iPhone app and you’ll see the most popular Mexican dishes listed in alphabetical order. Touch the name of the dish, and a mouth-watering picture appears along with a brief, but clear description of the food. At the bottom of the list in the “other” section is an explanation of the different kinds of meats and sauces, such as mole, pico de gallo, and yomatillo sauce. This app will come in handy when you’re at the food truck ordering from the short, confusing menu, or even shopping for ingredients for your quesadilla. In some descriptions, Mexi-Pedia will even fill you in on what meats go best with each dish and how to cook it! For an informative iPhone app, Toonalooney Studios, LLC nails it with its simplistic layout, yet descriptive explanations, and great visuals. For anyone out there who feels ashamed standing in the line at the taqueria, trying to remember if a chalupa is like those taco salad bowls at Taco Bell (again, I grew up in the Midwest), this app is priceless. On a side note, it turns out that a chalupa is a lot like the big taco salad bowls if it’s the Mexican version. The American version of the chalupa is wrapped in a deep-fried flatbread. Thanks Mexi-Pedia! AppSafari review of Mexi-Pedia was written by Amanda McFarland on March 31st, 2010 and categorized under App Store, Food, Reference. Page viewed 4396 times, 1 so far today. Need help on using these apps? Please read the Help Page.